It was a dark and stormy night. In the distance, thunder rolled. Rain fell in sheets across the windshield. The bright blue and neon green paint job was dull, almost black in the night. Inside, an athletic blond young man drove, a pretty red headed girl clad in purple in the passenger's seat. A bespectacled girl in an orange sweater read a book by a tiny flashlight. In the back, a wild-haired, scruffy youngster and a large brown dog munched on bone shaped snacks. Mystery, Inc. was on its way to the scene. The quintet of private investigators entered the home. Inside, a small boy waved around a video game controller. So engrossed was the lad in the game, he barely noticed the arrival of the newcomers. Next to him, on the couch, was the body. It was man in his mid thirties, stretched out, still grasping a pair of controllers, like the boy's. The man made a loud snoring noise, and the dog leaped ,whimpering, into the arms of the scruffy young man. "Zoinks!" Shaggy exclaimed. "I thought he was a goner, like, for sure! What's the mystery here, Fred?" The tall youth frowned slightly, and scratched his head, his elaborately styled hair bobbing with the motion. "I'm not sure, Shaggy. I thought it might have been foul play. The girl in the orange sweater peered through her large glasses at the screen. "Wait a second, Fred. 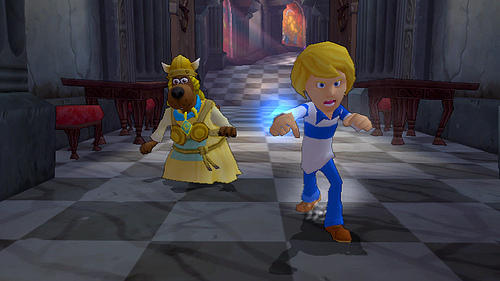 It looks to me like he's playing our new game, Scooby Doo First Frights! What a coincidence..." she said. The boy, still caught up in the game, laughed out loud at the on-screen antics. He looked perfectly happy. The girl in purple sat down on the couch next to him, and took the controller from the hands of the sleeping father. "Looks like we do have ourselves a mystery to solve, then, after all! 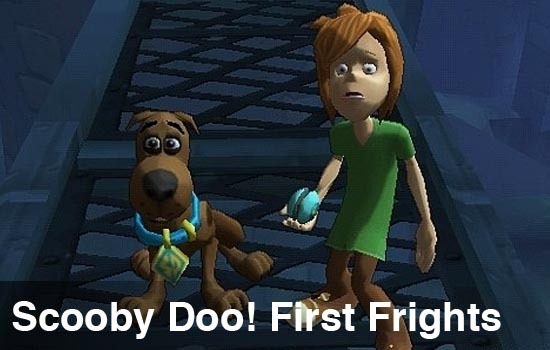 Why would a grown man fall asleep playing Scooby Doo First Frights, while at the same time, a little kid seems to be having the time of his life?" The kid cackled in glee once again. "Let's investigate and see if we can find some clues..." She pressed a button on the controller and soon she was in control of Fred, on screen. The other members of Mystery Inc. settled in and watched, while the dog headed to the refrigerator. "Hey, this is pretty cool. Fred looks cute! Look at him smacking those gargoyles around. He can even double jump in the air. I wish we could do some of these moves in real life, it might come in handy." Daphne chewed on her lip, and frowned slightly. "I have to say, this is a bit odd. I'd have expected something more like an adventure game, where you have to find clues and such. All we're doing is running around and bashing enemies. A LOT." Page created in 0.5933 seconds.